English Actress, best known for playing Arya Stark on HBO's Game Of Thrones. She mentioned (on twitter, Jan 2013) "I'm 5ft nothing actually!" and in 2014, said of her height: "I'm 5'1 and Rory's 6'5"
@ Mimi - What you have said is truly interesting! The average vote is 4'11.32" after 68 votes! I hope that Maisie had a great Birthday yesterday! A very Happy Birthday to little Maisie Williams, who turns 22 today! I saw her pop up as a Random Celeb yesterday and thought to myself, "Doesn't she look young! I wonder how old she is?" Now today, I have found out that in the above picture, Maisie was at the most 15 because today she turns 22 and she has also changed her hair colour to blonde now, so yes, she has changed quite considerably! I won't go under 5ft for Maisie. She looks young enough in the picture to be one of the small proportion of girls to have grown after 15. 4’11.5” at best, could be 4’11.25”. I think some commenters on this page have gone too low with their estimations! One thing I do know...a friend who is 5ft 3 was in her photo about 4 inches taller than Maisie that day, so she may well have been sub 5ft back then though hit the 5ft mark at 16. I agree with some of the comments below, she looks more like 4’11” in this picture, I’m not seeing that she’s the full 5 foot next to you. Maisie gives a similar impression to the 4’11ers on here, I think she might need a downgrade, Rob. I like it that she mentioned on Twitter "I'm 5ft nothing actually!"! She is cool and so is her height! It is interesting to know that Maisie, from Bristol, took part in skydiving for charity! She is mostly down as being 5'1" online but I have also seen a few 5'0" listings for her too! You tower over her Rob! There are so many people in 'Game of Thrones' that it really would be worth checking out! @ Sacred - I like your name, but ... I think you have gone too high to be honest! Looks about 4'11.25-ish, I guess she could say she's 5ft. in the morning. Most women are certainly not 5'7 these days Anon. 5'4.5 is the average height for women in the United States which most countries outside western Europe and Scandinavia would check out as even shorter then that on average. Maisie seems more like 4'11.5 to me but Rob did meet her. Maisie is a very pretty random celeb! I think she is 4'11.5"! Shouldn't 4'10 be at her forehead if she's 5ft? Imagine if a adult man was 5 foot Nothing.Most women are at least 5.7 these days. Editor Rob: yeah she was just turning 15 I believe, but I don't think she grew much after 15, I still see her around 5ft. 150cm flat is my guess, maybe 151.5cm on 8-10 hours of rest. Very cute gal. Maisie Williams is 5ft1 now, this picture is from 2012, when she had 14-15 years old. Someone 5'0 tall is not a midget especially not a female. That's like calling a 5'5 man a midget. You average woman's height is 5'4.5 in the United States. I would imagine the UK is similar and I would imagine in other parts of the world it could be a couple inches shorter then that. She's born in the same year as me. BUT I REFUSE TO SAY SHE'S THE SAME AGE. I don't see Maisie being 5ft1! I think she is well below, at 4ft11.25 - at the most! 4'11 is not a midget. It's short, but not quite a midget. I guessed 4'11 3/4 previously, I changed my mind to 4'11 1/4. Shes 4'10 and a half. Her hair gives the illusion of her being 4'11. Rob, your head has to be near 11 inches with smile in the picture?? Editor Rob: my head is typically 9.5 inches, although in photos at times it will appear 10 inches. Rob, I'd have to give her 4'10 to possibly 4'11. I just can't be any more generous, I'm sorry. Editor Rob: Dwight, some things are best not joked about. Realistically Rob, Maisie needs a serious downgrade to about 148cm. There's no way she is 152cm. Her frame is consistent with someone in the 148cm range. Lol why is she still saying she is 155cm (5'1)?? Struggling to hold 5'0 IMO, could even be 4'11 but maybe somewhere in the middle. I think shes about 4'10" or 4'11". If you watch Doctor Who, she looked tiny next to Jenna Coleman who is listed as being 5'2". Editor Rob: you could argue that Jenna looked 3 inches taller at times, but she too had some sort of heel, maybe the wedge sneakers. I think 5'0'' is a very accurate guess for her. Rob, if you're 5'8" and she's supposed to be 5'0", why are you very nearly a head taller than her? And I think you have a 10 inch head, right? That means she should be no more than 4'10.5" or 4'11"
You know, I'd have to give Maisie an added inch these days. I've been seeing videos of her recently, and she does give a vibe slightly more than 5'0". Probably 5'1" now like she said in 2014...it was possible for her to have grown at least somewhat since your photo was taken with her, right Rob? Editor Rob: she could have gained a bit, although generally I think she can still look around 5ft rather than 5ft 1. @avenger987: No, girls stop growing at 15 in average. She's 19. This is her final adult height. Rob, The more i look into it, the more i kind of start seeing more 4'10" or 4'11". She's really petite. I don't think she can really pull off 5ft flat at night, i think this might need a downgrade. Plus, you're not really standing up that straight in that pic either. Since you're 5'8" and have a 9.5 inch head. That means your chin is 4ft 10.5 off the ground. If you're standing up straight, then she could be right on your chin or underneath it at worse. I just couldn't see her being up to your lips. But if she is wearing flat ballerina shoes, then i could see a bit more. My sister is 4'10", and sometimes i mistaken her as 5ft at times since she kind of gives off that 5ft impression because she's almost 5ft tall by a couple of inches. Editor Rob: that day she was sub 5 foot, but still 15, so I thought she might have gained a bit more. She can certainly look at most 5ft even today. Do you measure each person that you meet for this?? Editor Rob: the value at the top is my estimate. Wherever possible I also mention what an actor has claimed as a reference. Rob,your head is 9,5in right ? Do you really think she is more than 150cm ? Editor Rob: I think about 5ft is fair for her, I know with some people that day she could look a bit under 5ft though. I am pretty sure she is no more than 152. I am just surprised there are still people who think she is 155cm. In some places it is even considered a fact. Editor Rob: by 15 she didn't grow anymore from what I've seen of her. Why are there still people who believe she is 155cm? Man, height is such a weird thing.. When I see you with 196 guy, who's 23cm taller, and he's not one head taller than you and yet Maisie, who's like 21cm shorter is actually almost under your head... I'm 174cm (I was measured in school and it was 100% accurate) and I feel like most of my friends who are like 196cm(also measured in school) are almost one head taller than me..
She could be just under the 5'0 mark, like 4'11.75. 5 feet seems spot on, nice proportions make her look her age! Great actress as well. Looks like a chav queing up to sign on!! 4'11". You have near a full head on her. She looks more 4'11 here. MarkyMark: I hope it's not considered a spoiler, but you got it wrong. Arya does not become a "great warrior" at any point, nor was she ever likely to be. She becomes something else (which is a spoiler, so I'm not going to say). And she is supposed to be tiny in the books, small and thin, even for her age - and she is just 11 in the latest books (as opposed to the show, where she's about 13-14 and played by a 17-year old actress). Rob, you met Isaac at the last convention? Is he really 5'8 in person? In this picture she looks about 4'11". Rob,how tall do you think Isaac Hempstead-wright is? maybe 173 cms. Love her character in GOT ! Wonder if the stop of her growth will affect the script cause she was apparently meant to become a great warrior or something but she's too small for that now. Which basically discredits her own recent 5'1" claim. She's a whole head shorter than 5'8 Sophie Turner. So she must be around 4'8. @Rob I agree that this is probably the case. Sophie's feet look more inclined than Maisie's in this picture. [Editor Rob: About 5ft is ok for her, I'm not sure if she is near 5ft 1 as she says, I would be surprised. @Pedro I don't think he looks taller than Kit there. I think he's just 5'7 range. He has a small head. But he's only 14, he could still grow quite a bit. @Emily Yeah, but Isaac is looking down in the picture and if we look closely at his legs we can see that he is not standing completely straight. So I personally think that Isaac is more likely somewhere between 5'8"-5'9". But he is 14 years old, which is the age where boys normally grow the most. Isaac looks shorter than Rob there. But we don't know their footwear. If she didn't grow anything more, Isaac looks 5'7 range. So does anyone know the answer after looking at the picture? She for sure never going to be tall...she might grow another inch or two after 16 but probably not anymore. Looks like a smidge more difference between her and Sophie Turner than there is between her and Rob. I wonder if she'll grow any taller. At her age i only grew about 1 and a half inch taller. Geez, the girl is tiny. But that helps giving her the looks of a permanent child in GOT. She said on 29 Jan 2013 on twitter "I'm 5ft nothing actually!" 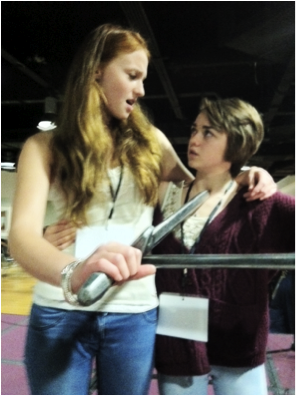 Maisie is not as tall as Sophie Turner (Sansa) who is 5'9". So I'm guessing she 5'4"
She looks more like 9 or 10 inches shorter than Rob, not just 8. Was she resting heels in this pic Rob? Doubtful a full foot shorter, Rob doesn't have a 12 inch head. Or do you rob? [Editor Rob: this photo is pretty recent, so she's just about 15 and I guess always a chance she could grow a bit more. Looking straight ahead usually 9-10 in a photo for most people and many women can have 8.5-9 inch heads aswell. Looks a foot shorter @ 4'8.